You get a Blu-ray movie in either disc or folder, and now you want to import Blu-ray movie to Final Cut Pro to make some editings? You are wondering how to make it work since Final Cut Pro only accepts DV, HDV, P2 MXF (DVCProHD), XDCAM, MOV, MP4 and 2K film formats. Blu-ray movies are currently not recognizeable by Final Cut Pro. You can make good use of a professional Blu-ray to Final Cut Pro converter to convert and rip Blu-ray to Final Cut Pro compatible video format, and then import Blu-ray to Final Cut Pro. Please read the post carefully to find out more details of ripping and importing Blu-ray to Final Cut Pro. Part 2: How to Convert and Rip Blu-Ray to Final Cut Pro on Mac with Professional Blu-Ray to Final Cut Pro Converter? Part 3: How to Import Blu-Ray to Final Cut Pro for Editing? Having advanced and powerful editing features and released by Apple Inc., Final Cut Pro is definitely the best tool for personalized videos or movies editing on Mac. Various video sources can be imported into Final Cut Pro for editing, such as sources from cameras, drives, network locations, and camera archives, however, Blu-ray videos are not in the supported list by Final Cut Pro. From the chart above, we can clearly know that Blu-ray video is not supported by Final Cut Pro. Therefore in order to import Blu-ray to Final Cut Pro, we have to rip Blu-ray to Final Cut Pro supported video formats, such as MOV, MP4, etc. Ripping Blu-ray to Final Cut Pro is not a complicated process. Actually, we can acheive the goal with the help of a professional Mac Blu-ray to Final Cut Pro converter. To get the ripping work done, you could use Leawo Blu-ray Ripper for Mac, a professional and easy-to-use Blu-ray to video converter for Mac users to complete Blu-ray conversions on iMac or MacBook. Acting as Mac Blu-ray to Final Cut Pro converter, it could easily rip and convert Blu-ray to Final Cut Pro compatible videos like MP4 and MOV in a few simple clicks, with high quality. With this Blu-ray to Final Cut Pro converter for Mac, you could freely import Blu-ray movies to Final Cut Pro for editing after converting Blu-ray to Fina Cut Pro compatible video formats. Check the below step-by-step guide on how to convert Blu-ray to Final Cut Pro videos on Mac below. 1. Download and install Leawo Blu-ray Ripper for Mac. 2. Connect your Mac computer to the Internet as ripping encrypted Blu-ray disc requires internet connection. 3. Mac computer with BD drive. After launching Leawo Blu-ray Ripper for Mac, you could see a “Add Blu-ray/DVD” button. Click it to load source Blu-ray movies. After loading source Blu-ray movies, you could select subtitles and audio tracks, play source Blu-ray movies, snap screenshots, etc. Click the clickable drop-down box before the big “Convert” button and then select “Change” option to enter “Profile” frame and choose MP4 or MOV from “Format” group as output format. You could click “Edit” button on the drop-down box to adjust video codec, audio codec, bit rate, aspect ratio, frame rate, channel, etc. On the main interface, click the big green “Convert” button to call out a sidebar, on which you need to set output directory. 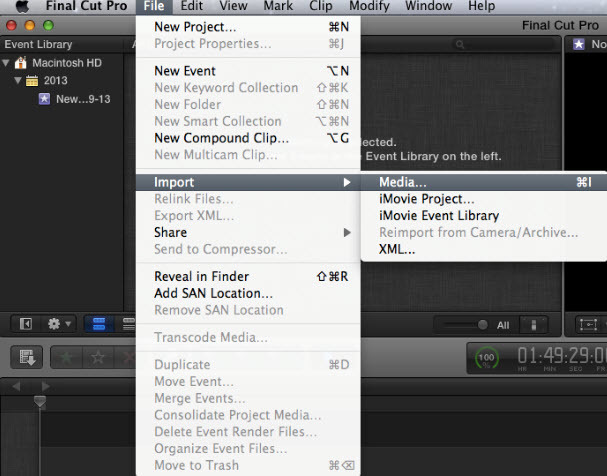 Start Blu-ray to Final Cut Pro conversion by clicking the bottom “Convert” button on the sidebar. After conversion, you can then import Blu-ray to Final Cut Pro for editing. After converted into Final Cut Pro compatible video formats, the Blu-ray movies can then be easily imported into Final Cut Pro. Launch Final Cut Pro on your Mac to enter the mani interface, on the top of which lies a menu. Click “File” button to pop up a panel, on which you shall click “Import”, and then “Media” on another pop-up panel. Once “Media” is clicked, you can freely choose media file to import. In this case, you should go to the output directory which you set in the third step of Part 2 and choose the converted Blu-ray movies for importing Blu-ray to Final Cut Pro. After chosen, the Blu-ray now in Final Cut Pro compatible video formats will be imported into Final Cut Pro. Then you can drag the imported video on clips window to timeline for editing.